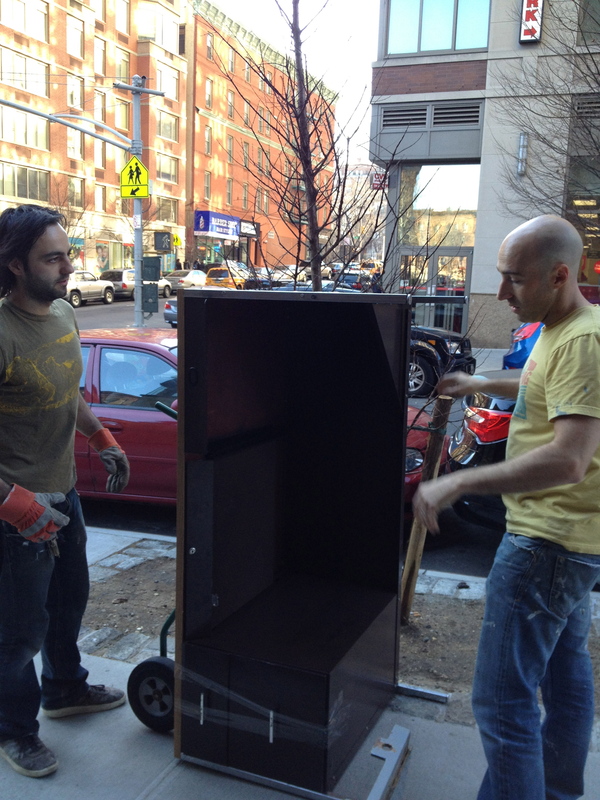 NY Mag’s Grub Street announced our impending opening last week. 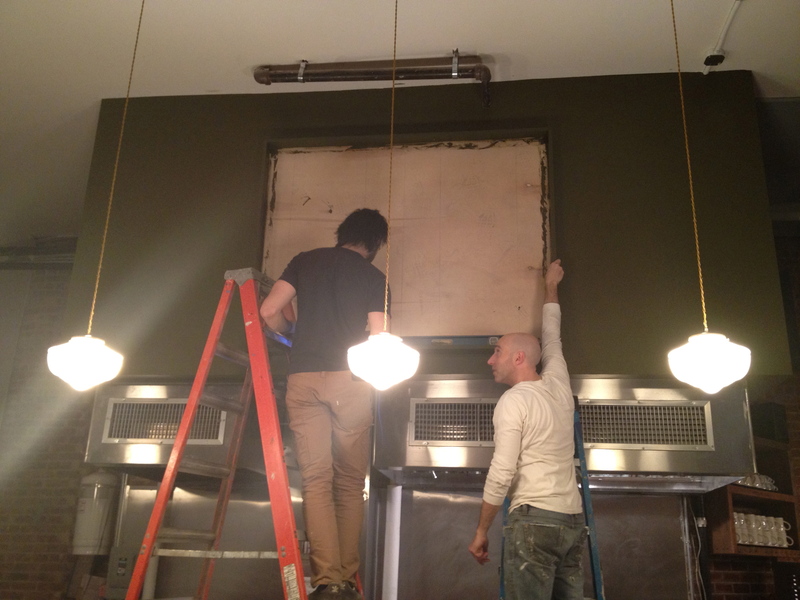 Not sure why they chose to post a photo that featured our unfinished menu board, but hey. 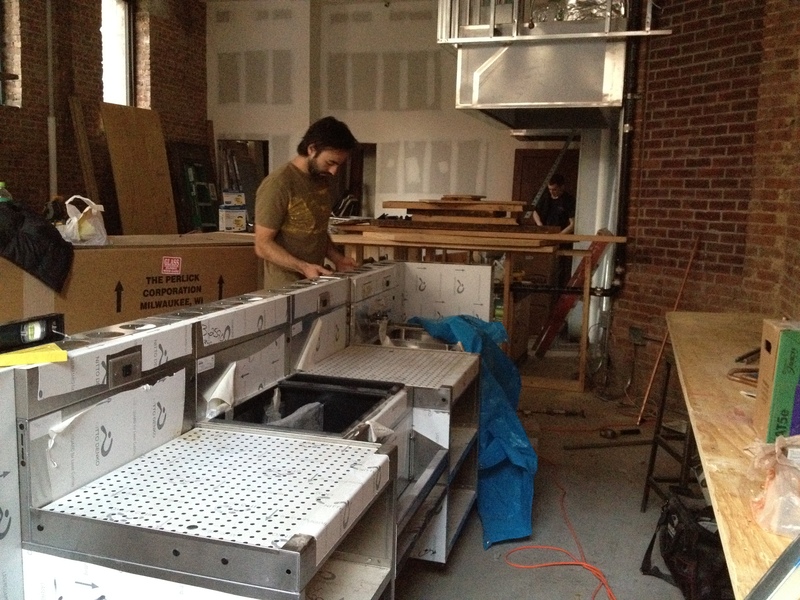 Here’s the link: ABV Wine Bar Almost Ready to Start Pouring and Cooking. Anton installed our draft lines. 6 beer lines and 4 for wine. 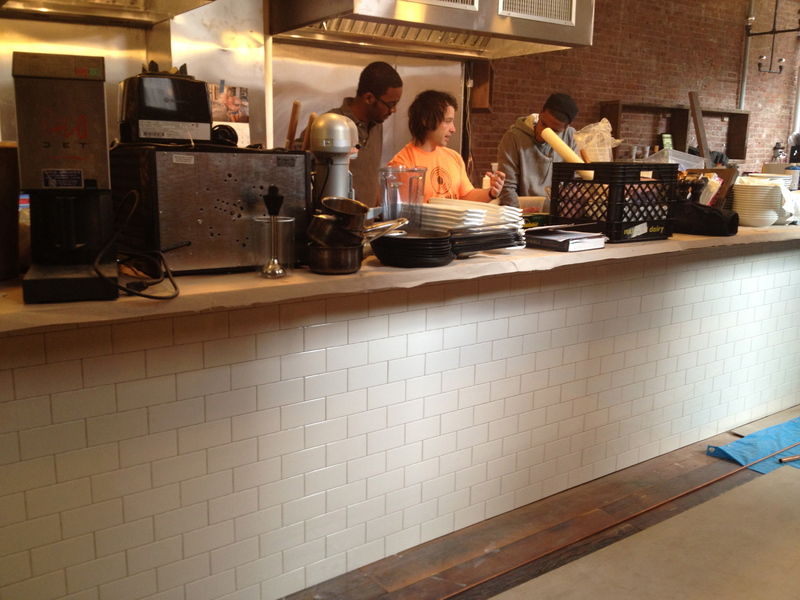 We tiled the front of the food bar. 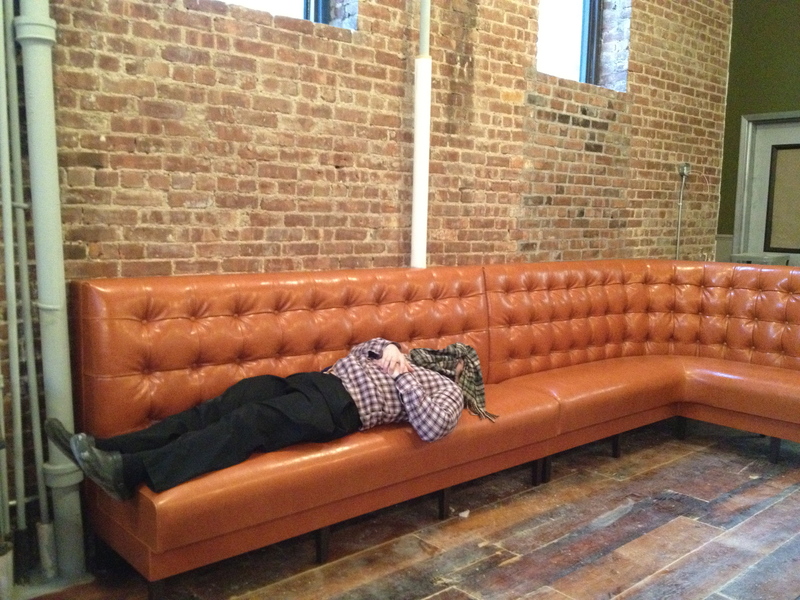 Our custom banquette was installed. Corey tested it out for us. 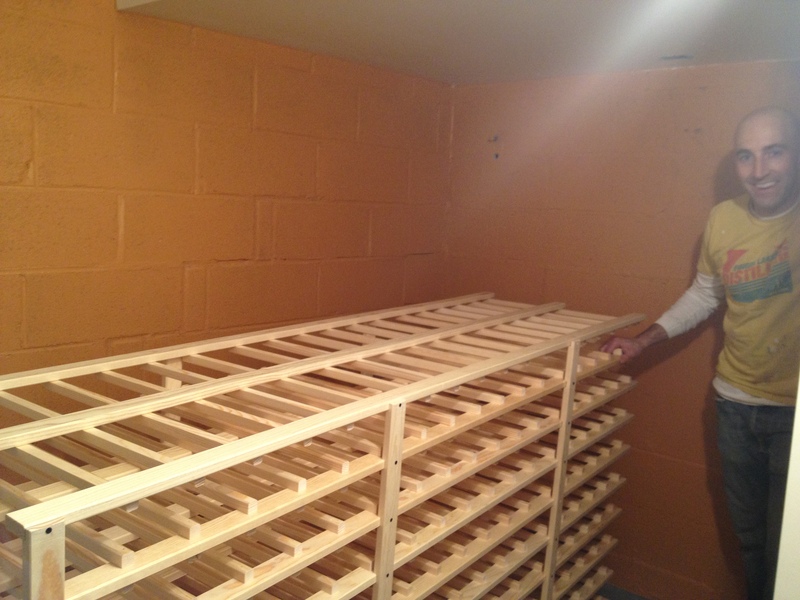 We assembled the shelving for the wine room. We picked up our license from the SLA last week, so this puppy is on its way to being full. All of our friends who come to see us get put to work, especially those who are handy. 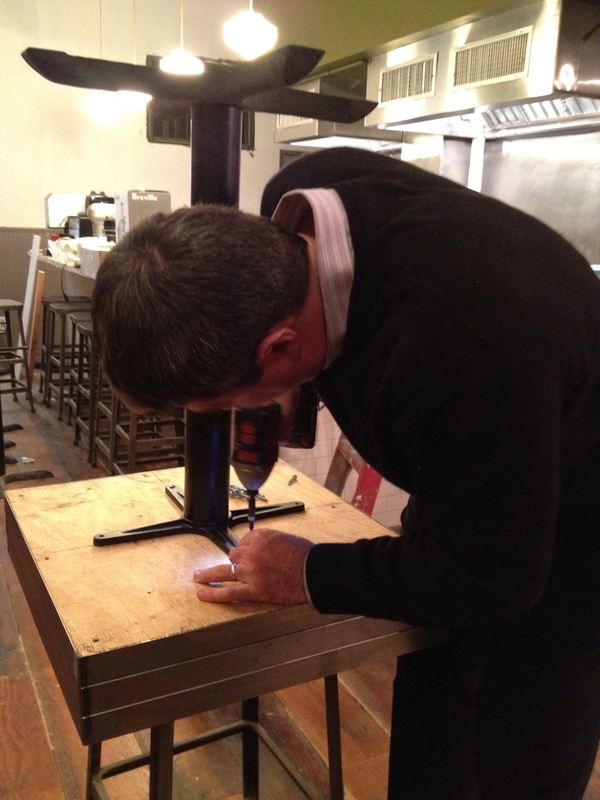 Here, McCloskey attaches our table bases. Oh, Philipp's in town? I hear he's good with a sander. 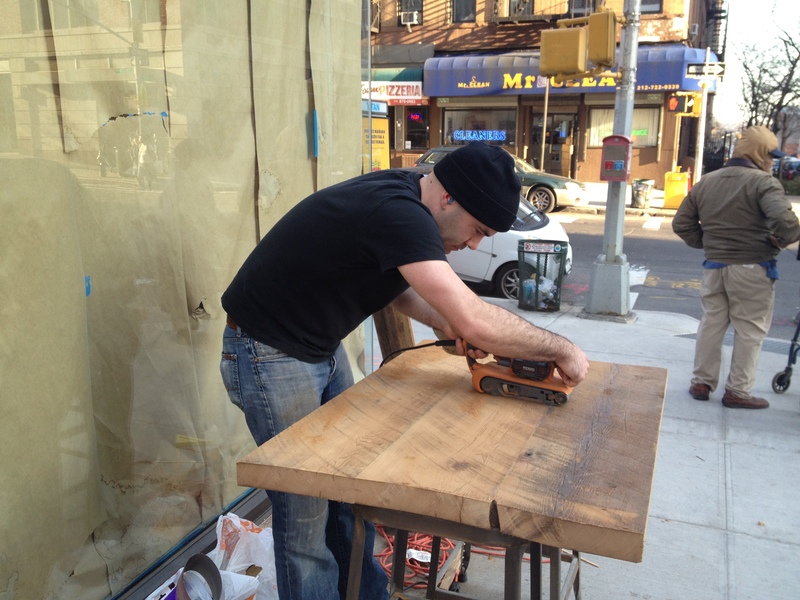 Finishing our last table! We bought a desk for the office at a church rummage sale. 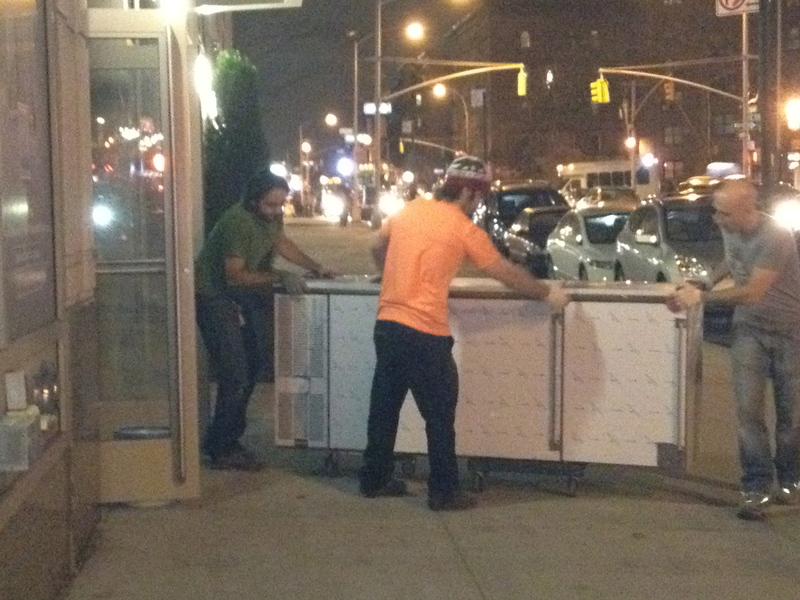 Noah walked it the 5 blocks to our bar using a hand truck. Here, Mike and Noah assess the best way to get it down the hatch. 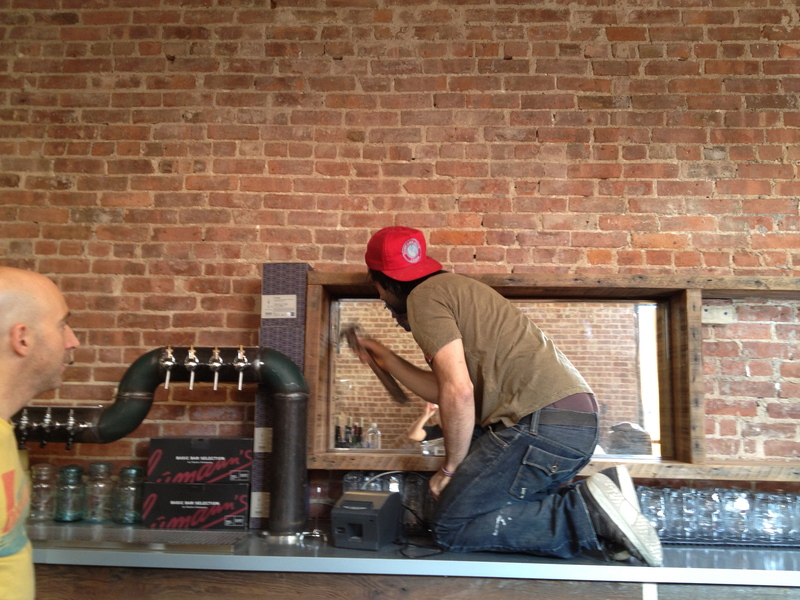 Putting the mirrors on the back bar. Leo joined us for cocktail training. 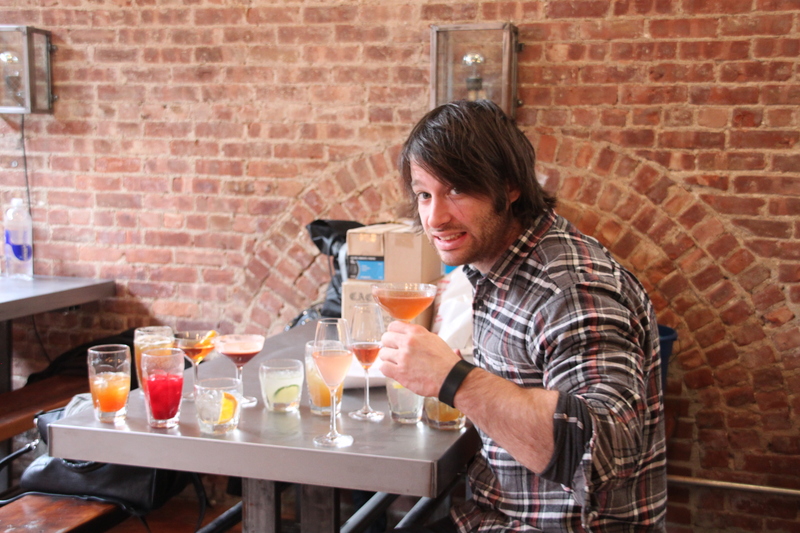 Corey enjoying the aftermath of cocktail training. 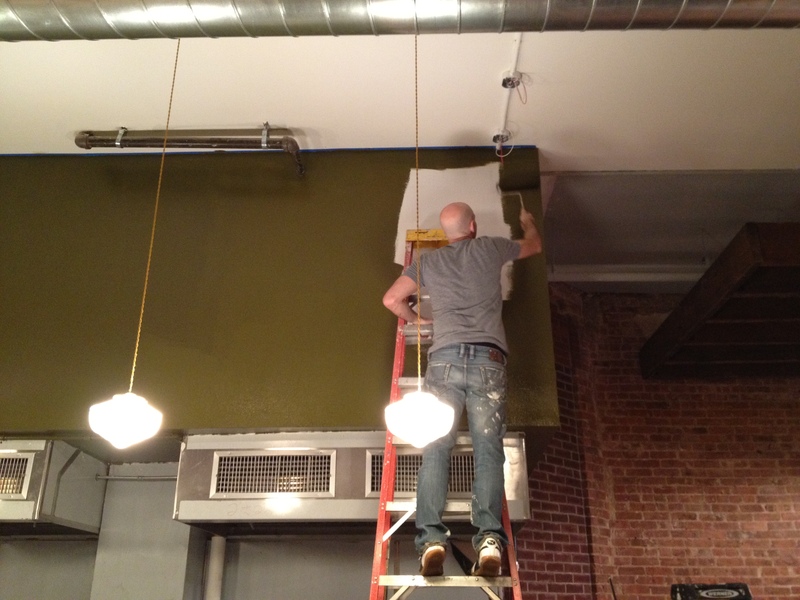 We hung our menu boards. We're waiting for our last batch of letters to arrive. At one point, we contemplated basing our menus on what letters we had. 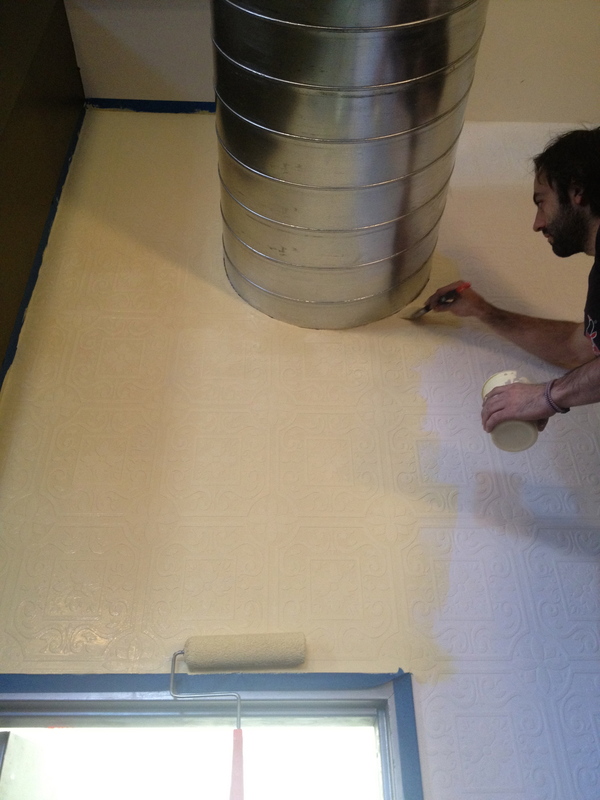 We had our textured wallpaper installed and then we painted it. 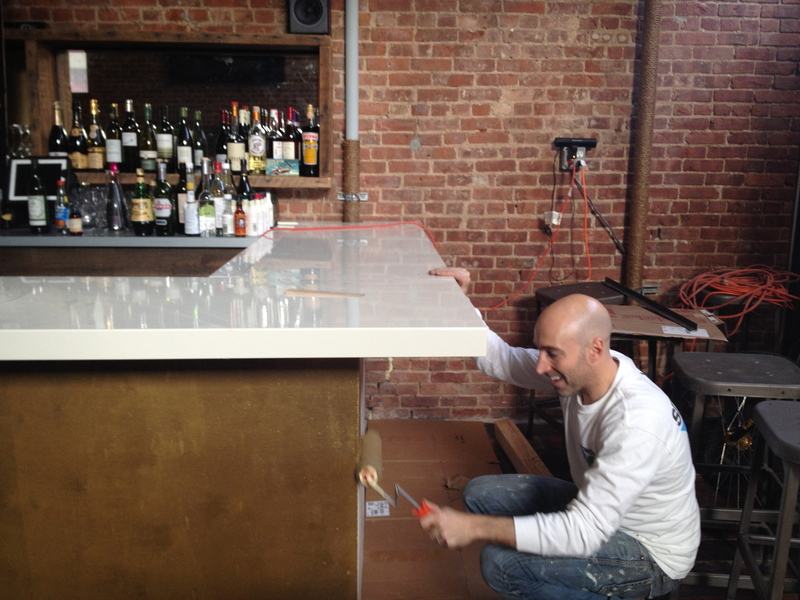 Noah adding a metallic gold coat to the front bar. Wait until you see step 2. 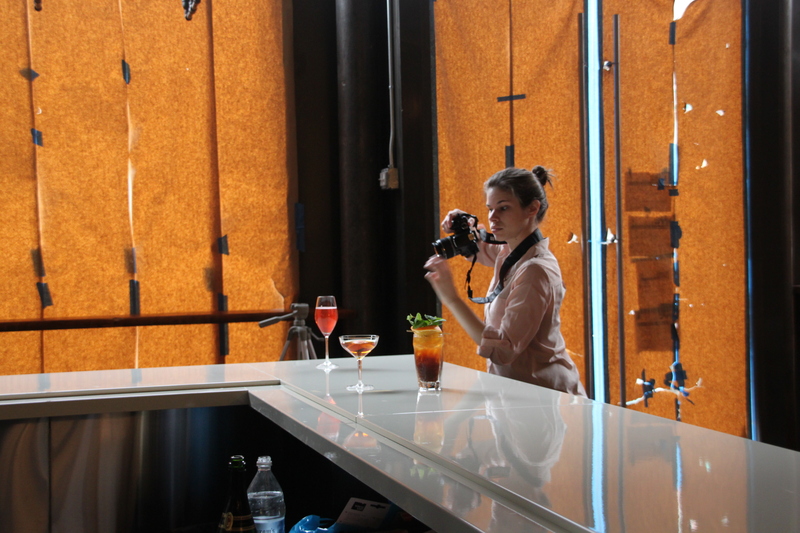 We had a photo shoot yesterday. Stay tuned to learn what is was for! We’ve been busier than elves. I’m happy to report that construction is done and now we’re on to the details. 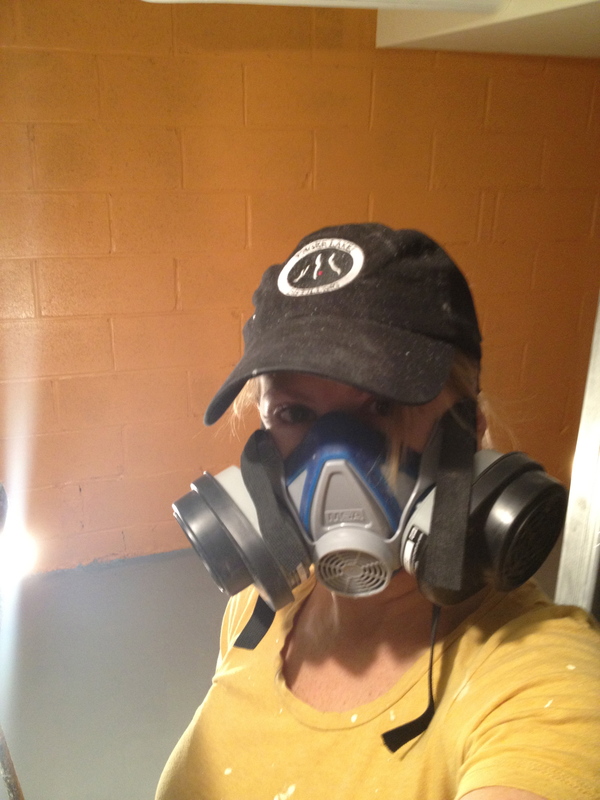 Finishing up the kitchen soffit. 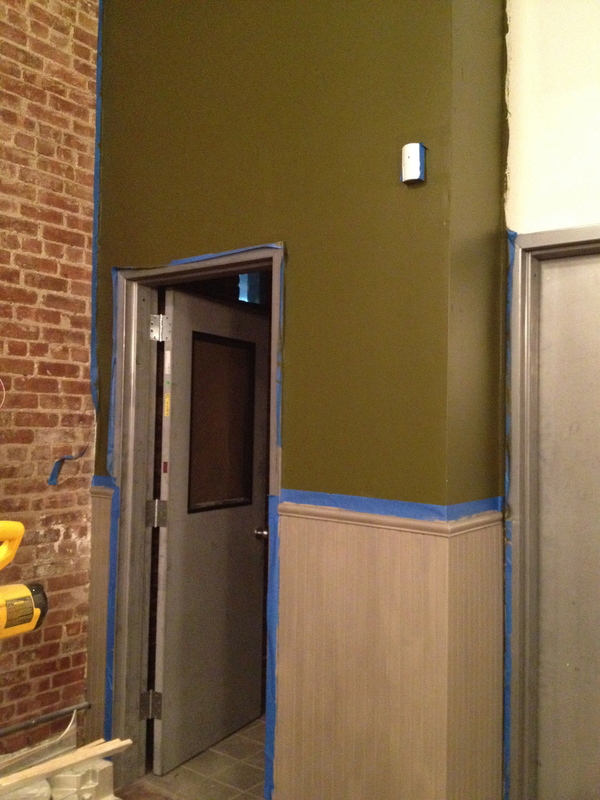 We matched the wall in front of the restroom to the kitchen soffit. 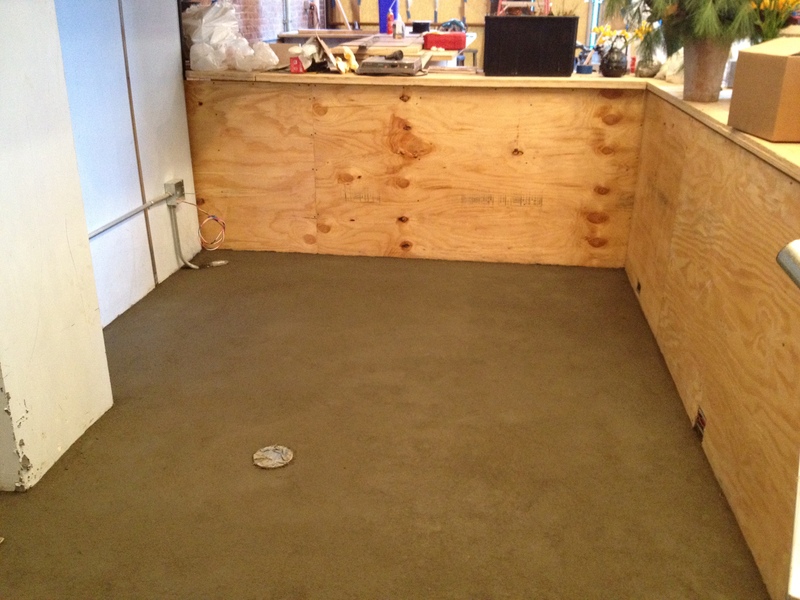 Kitchen refrigeration went in. All equipment is installed and working. Corey is in there cooking today. 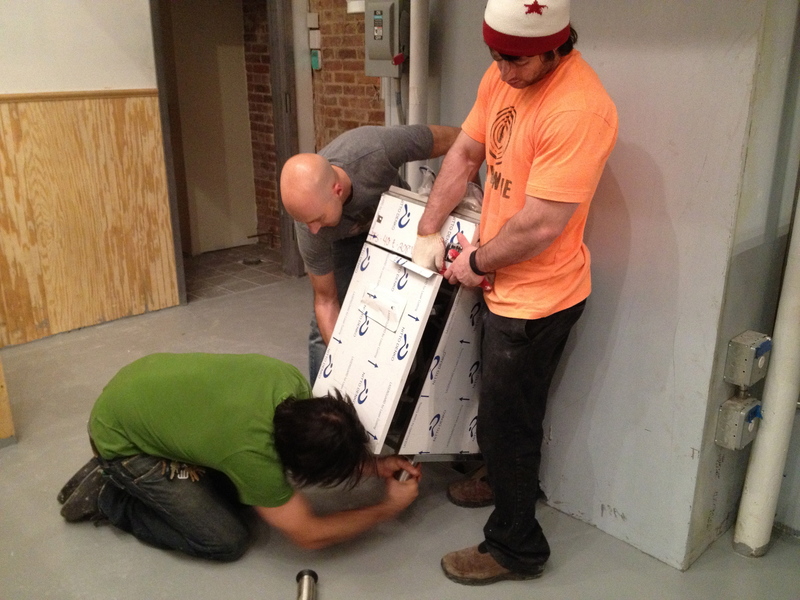 Wait til you see what we're doing with that 4 inch pipe on the counter. 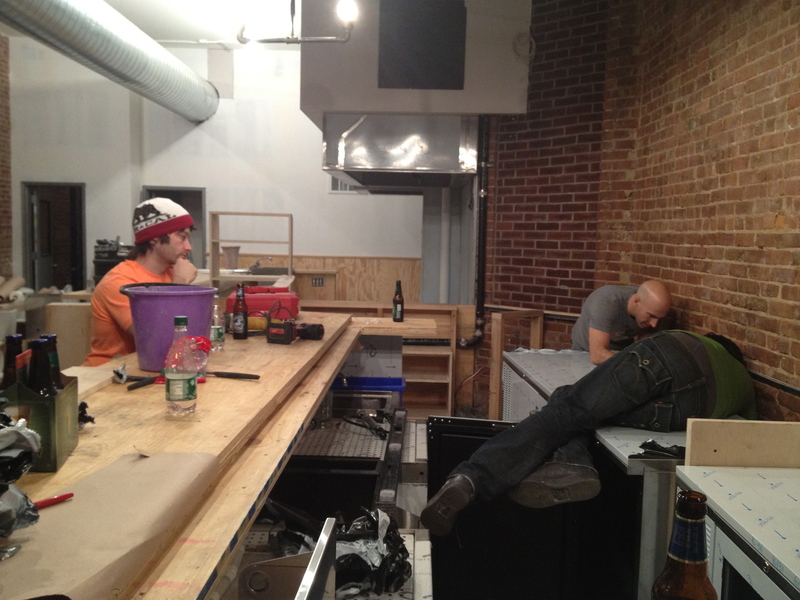 Working on the back bar. Mirrored shelves in progress. Putting together the office chairs. IT equipment all installed. Carpet arriving tomorrow. Hanging shelves and wine maps today. 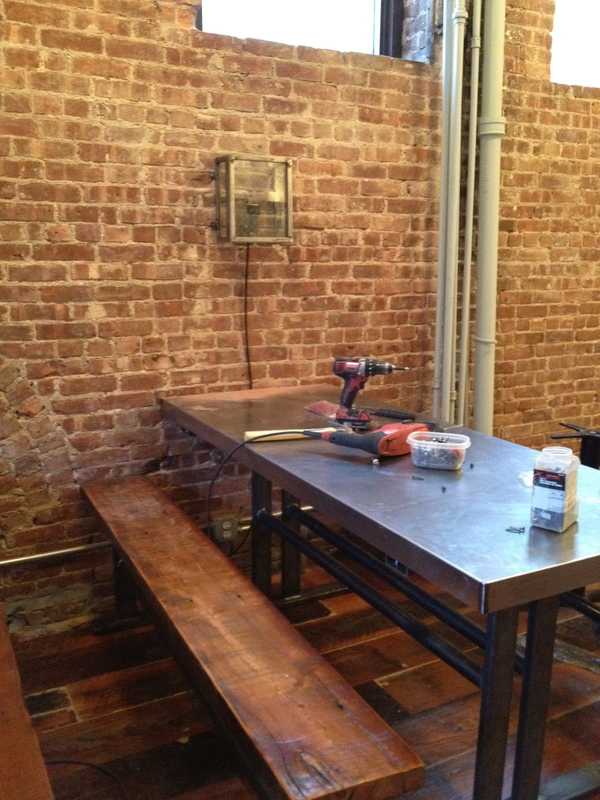 Tables and benches are here. Check out that sconce! 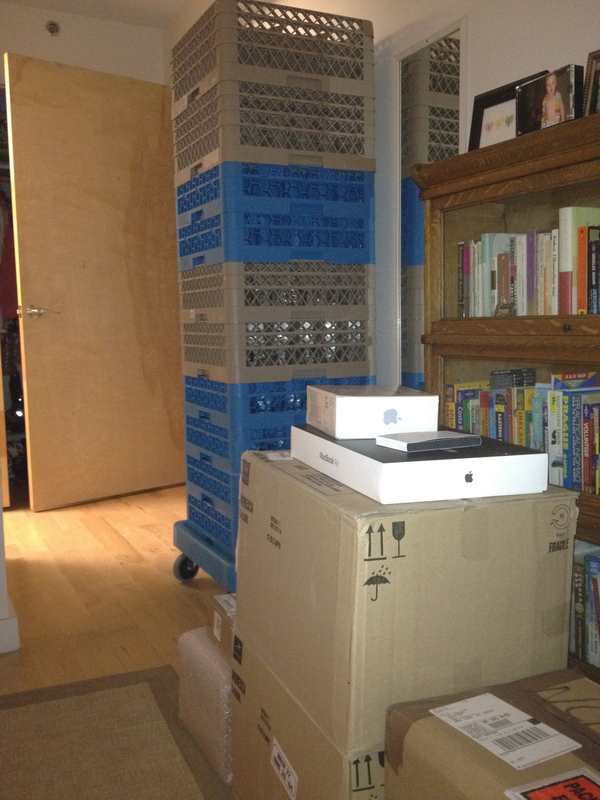 Organizing the basement. Look! It's small wares! 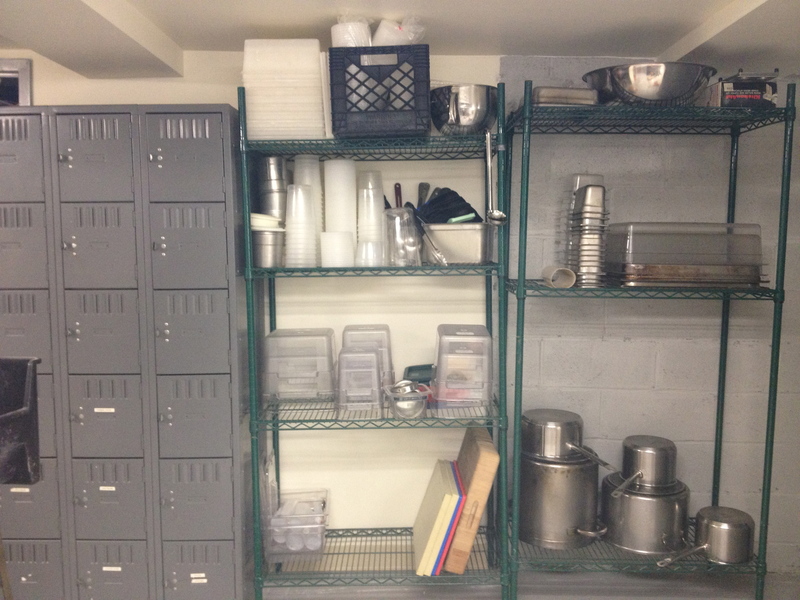 I'm particularly pleased with the lockers. Hum to the tune of “Here Comes Santa Claus”. 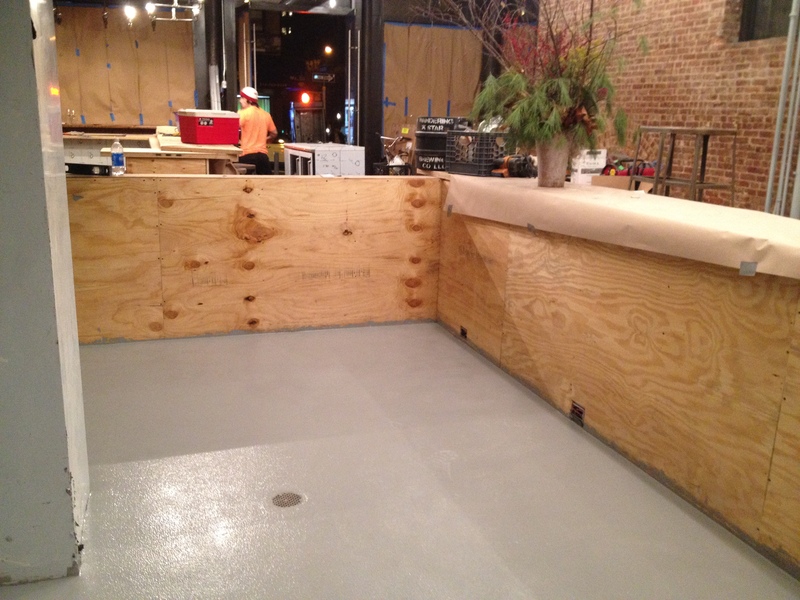 Epoxy on the kitchen and back bar floors was finished last week, which meant we could start bringing our equipment in. Dual-temp, wine slide-out racks. Yeah, baby. Here comes her big sister down the street. Our landlord was kind enough to let us house all of our equipment in his not-yet-rented commercial space next door during our build out. 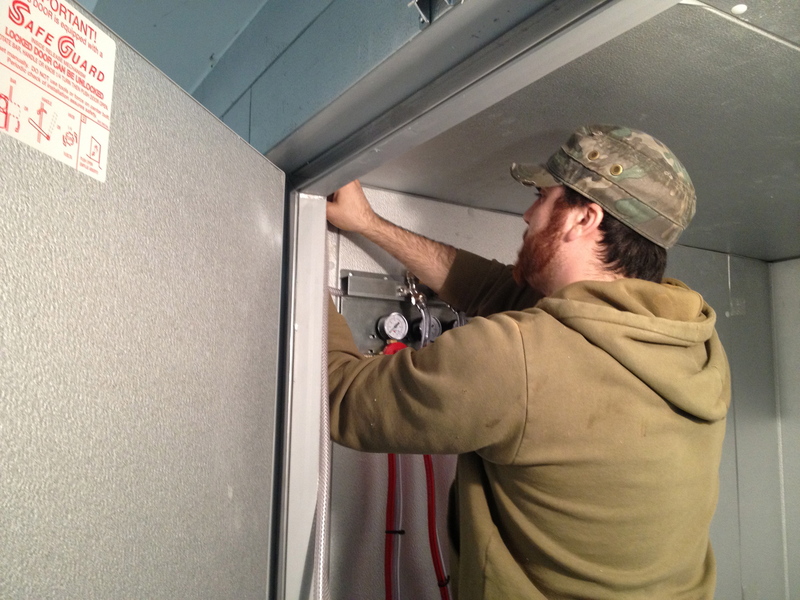 Fiddling with the plug on the back bar fridge, under Corey's supervision. Adjusting the legs on the fryer. 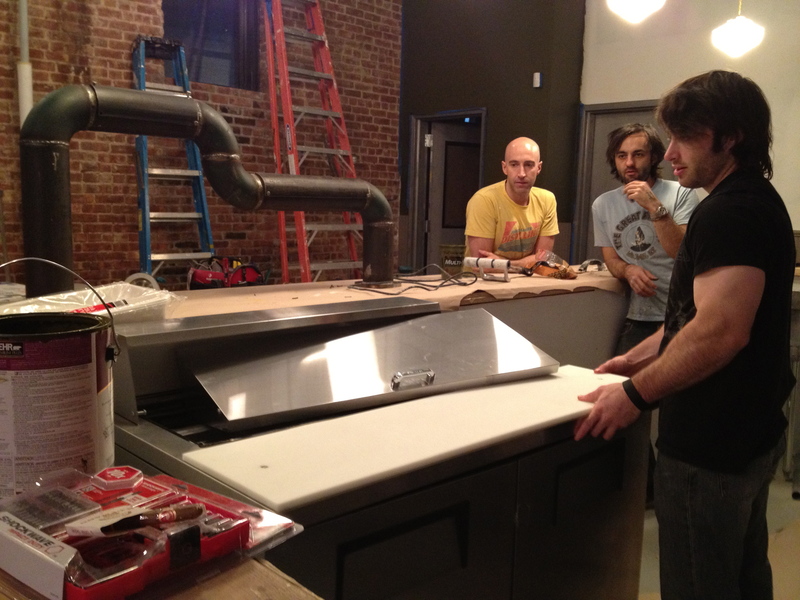 This may be the piece of kitchen equipment and I am most excited about. I haven't used a commercial fryer since making taco shells during my salad girl days. 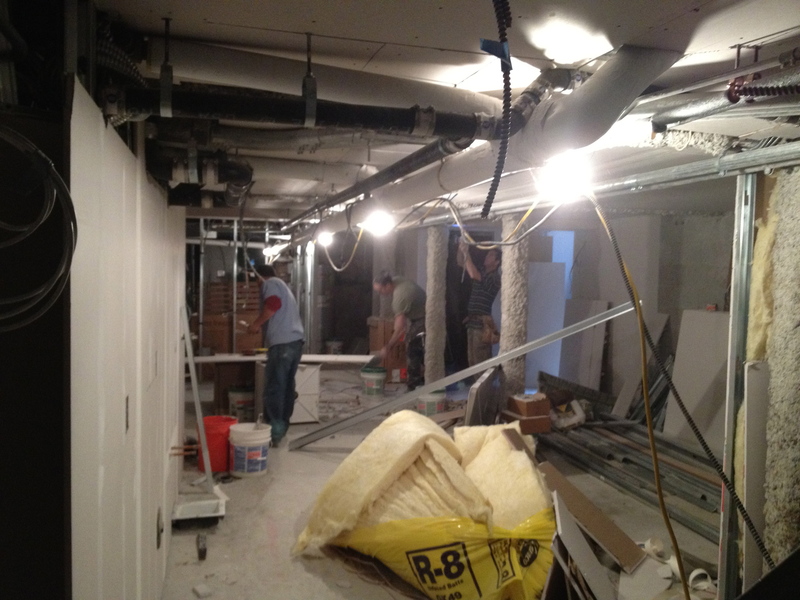 The basement is almost done. 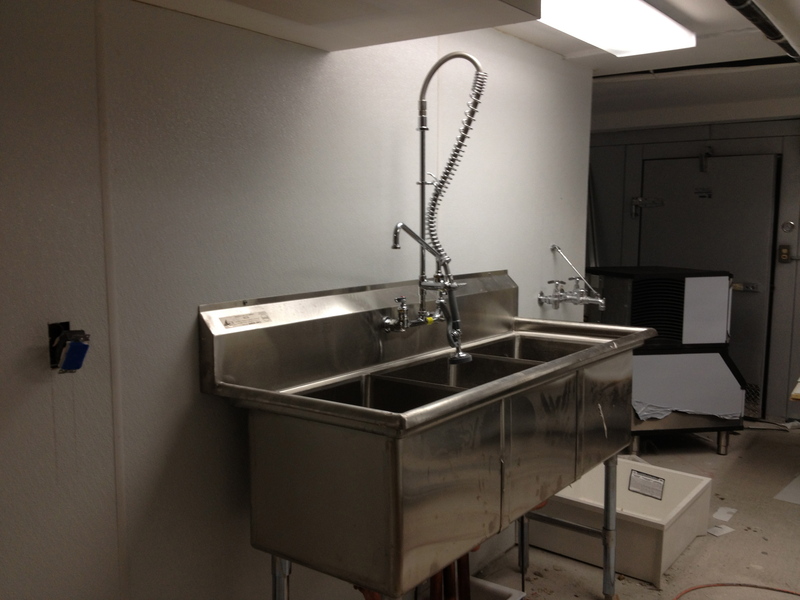 When I saw the FRP on the walls and the pot sink installed, it brought a tear to my eye. I'm not kidding. 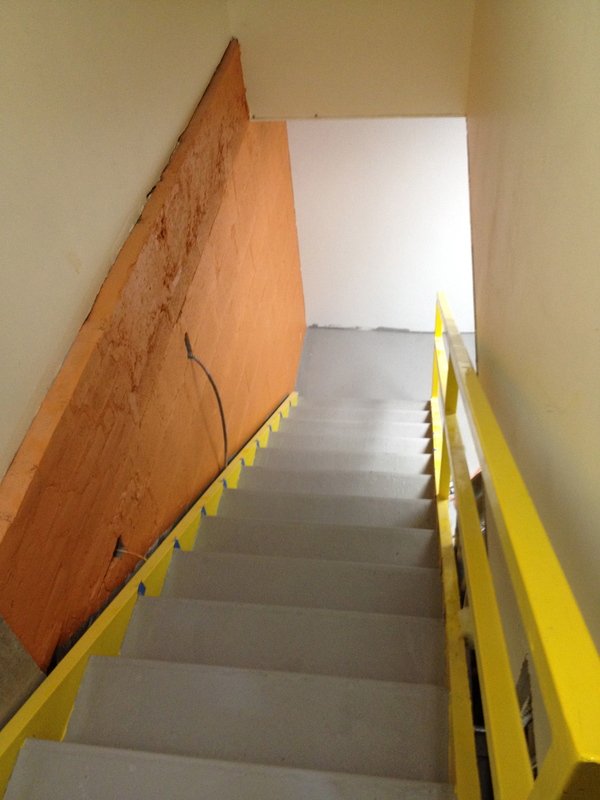 The basement floor and stairs are now painted. We're continuing our cheery theme down there. The beginnings of our second bathroom. Tiling to come. It’s not my two front teeth. I’m sure you all can guess. I am happy to announce that all construction will be wrapped up by this weekend. 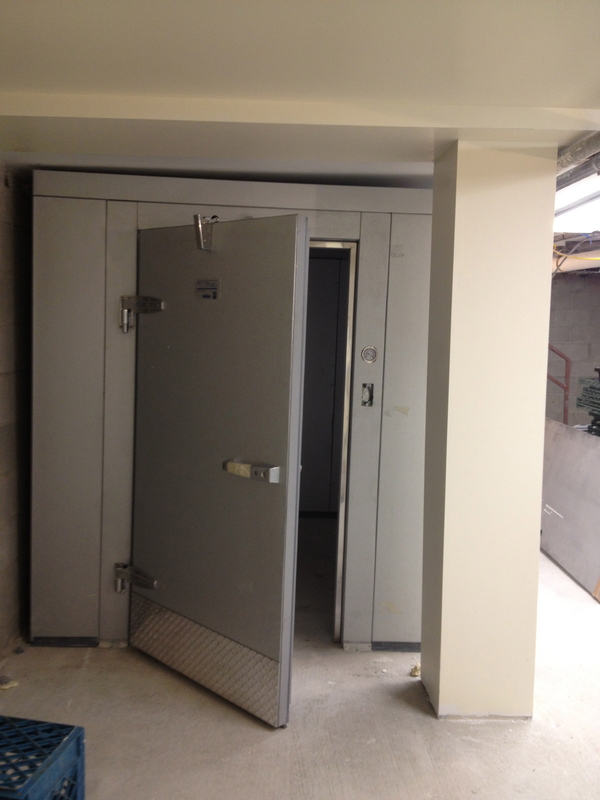 Our two walk-in boxes have been installed. We poured the floors behind both bars. They've since been covered with grippy, waterproof epoxy. We'll be starting to move equipment in today! 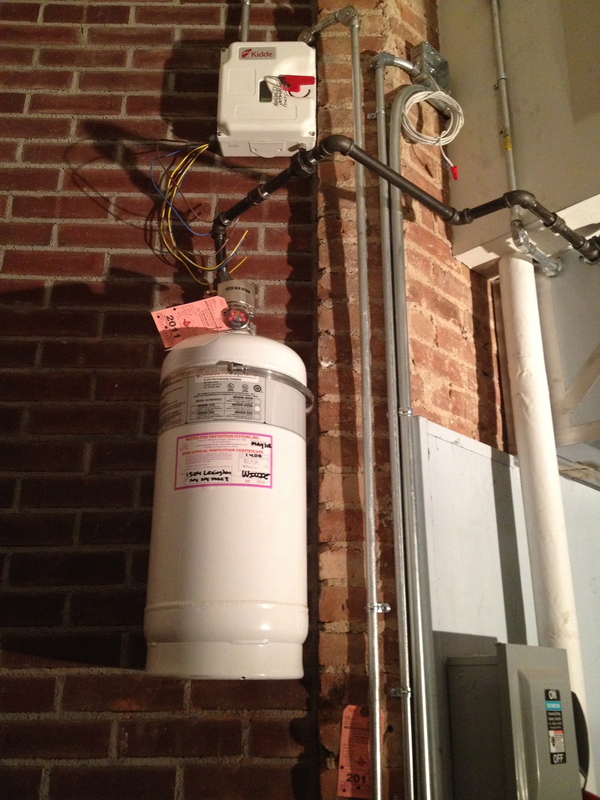 Con Ed installed our meter this week. 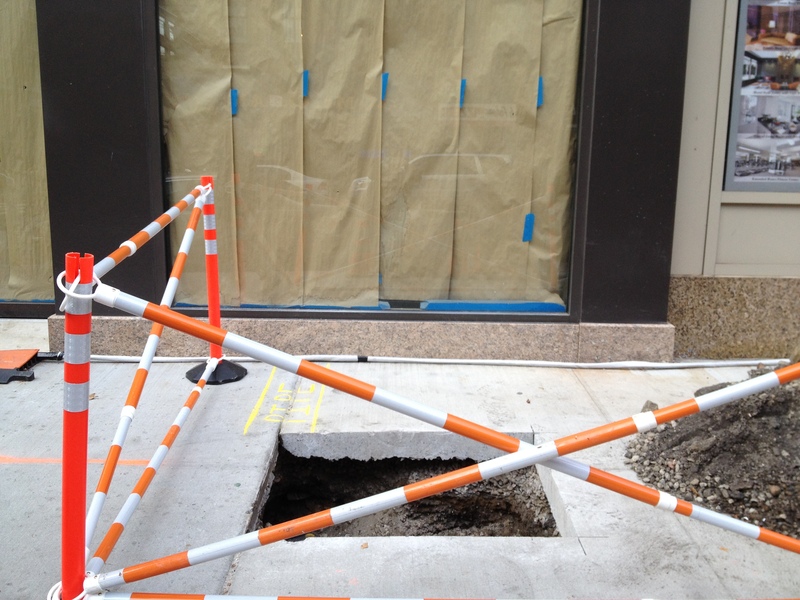 Our landlord was thrilled by the holes in the sidewalk and on Lexington Ave.
Mike working on more of our lighting. 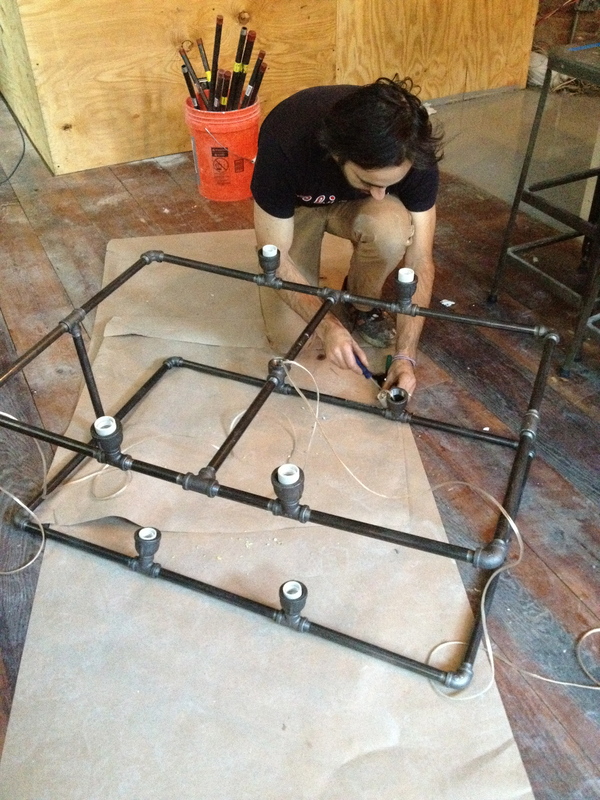 With all of our extra time, we're going to start a lamp manufacturing business on the side. All of our lights will be hung by tomorrow. I wanted to play Darth Vader, too. My wine room is now "pumpkin spice". 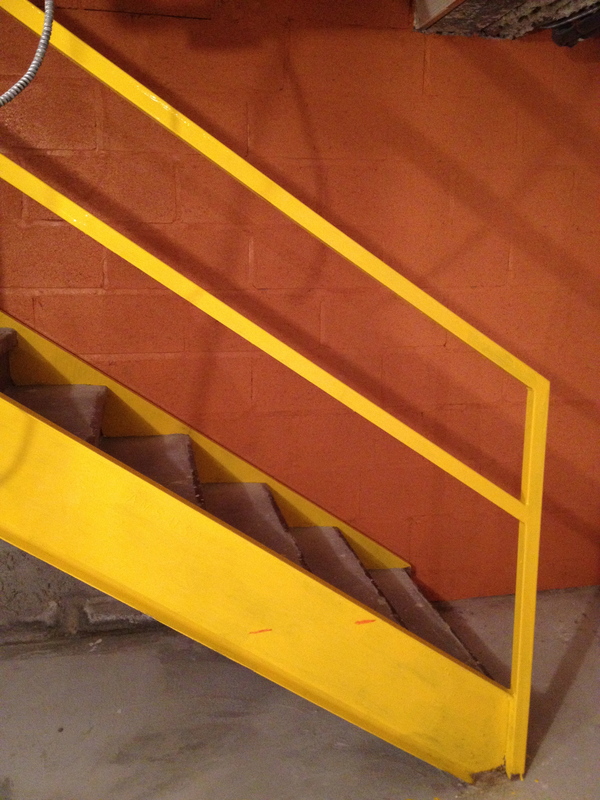 Our freshly painted basement stairs. We're keeping it chipper down there. 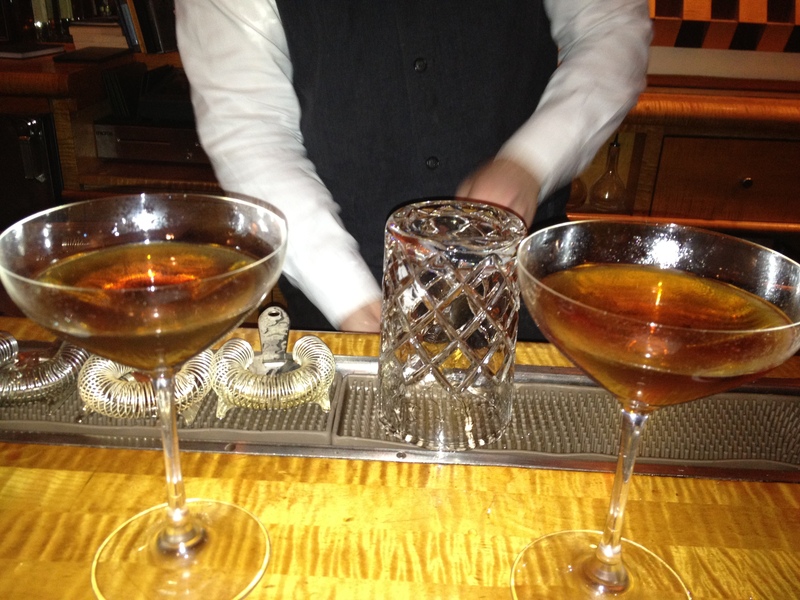 I am thrilled about our cocktail program. I'm getting some help from a very talented friend. 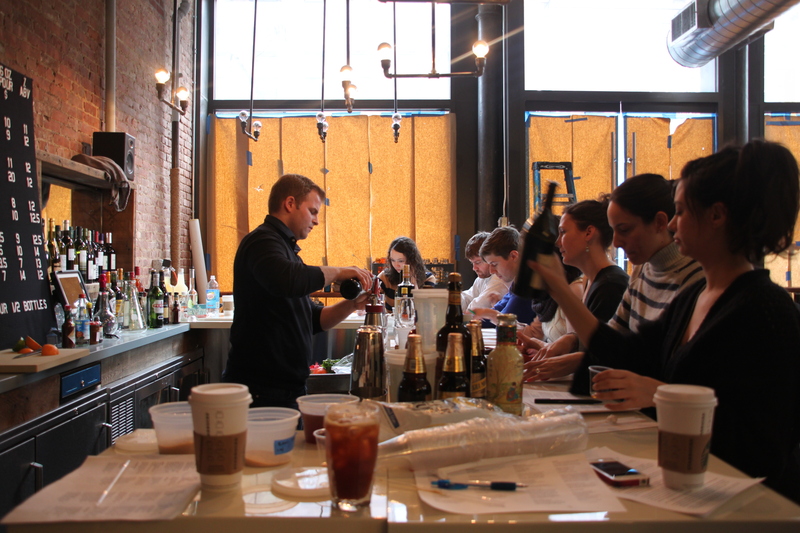 Mike and I were hard at work taste testing in this photo. I could open a restaurant out of my apartment right now. Those glass racks are taller than me. Excited to start moving all of this stuff to the bar this weekend. 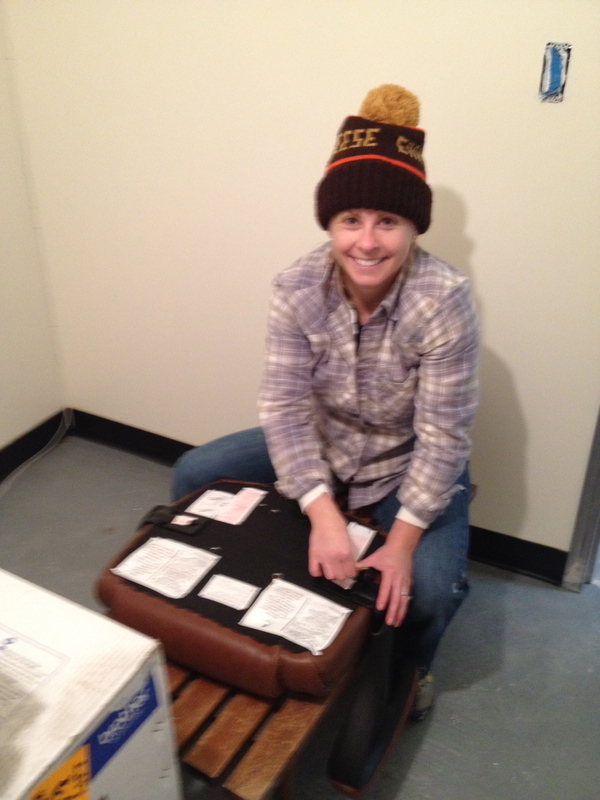 With all that has been going on, we weren’t planning on making our annual trek upstate for Thanksgiving. 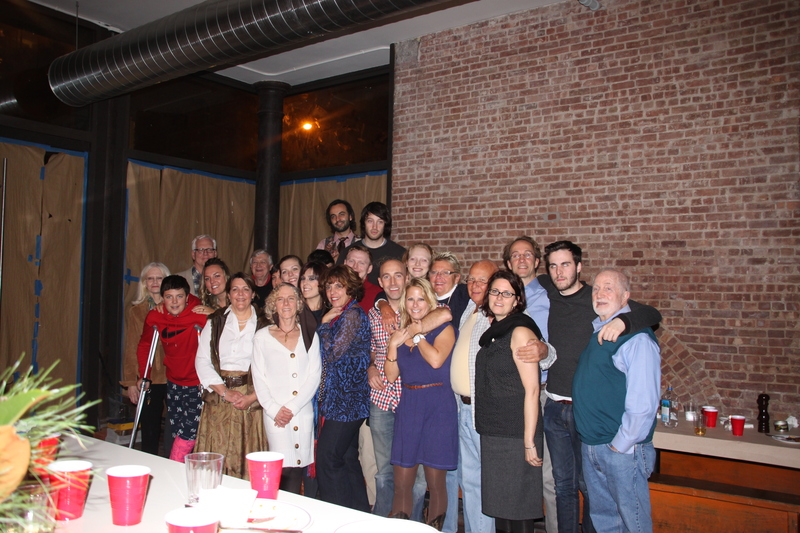 Instead, we invited our families to NYC, to celebrate with us, at our unfinished bar. A charming idea that required quite a bit of work, but was a success. 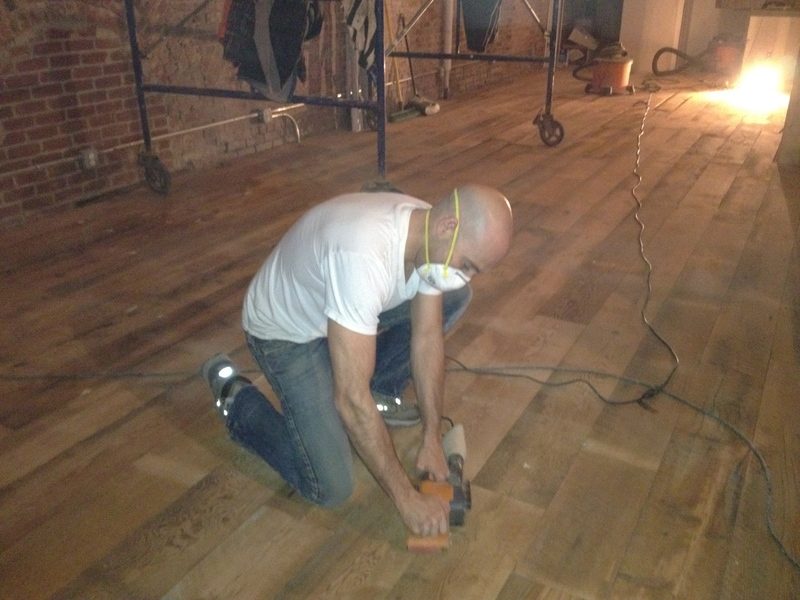 The floor was in, but needed to be spot sanded. The varnish we applied to the floor was pretty gnarly, hence Noah's Star Wars get-up. 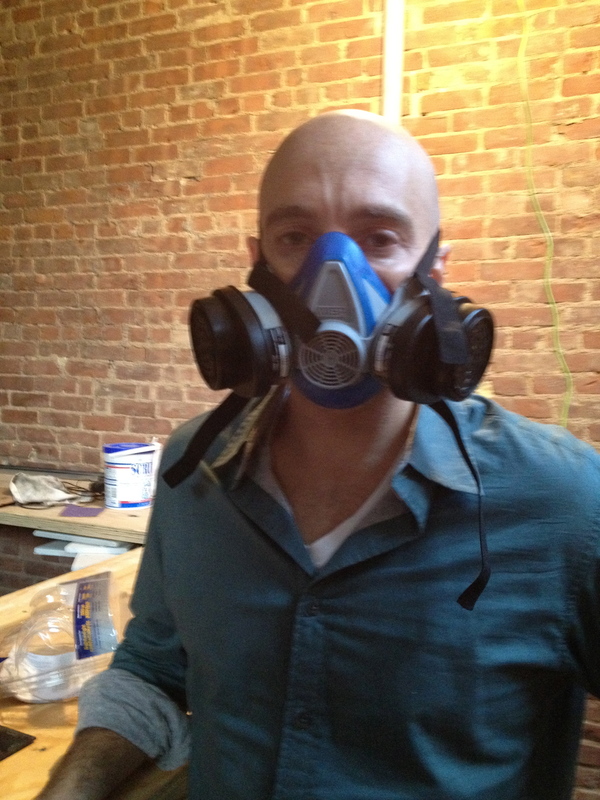 What Thanksgiving would be complete without duct work? 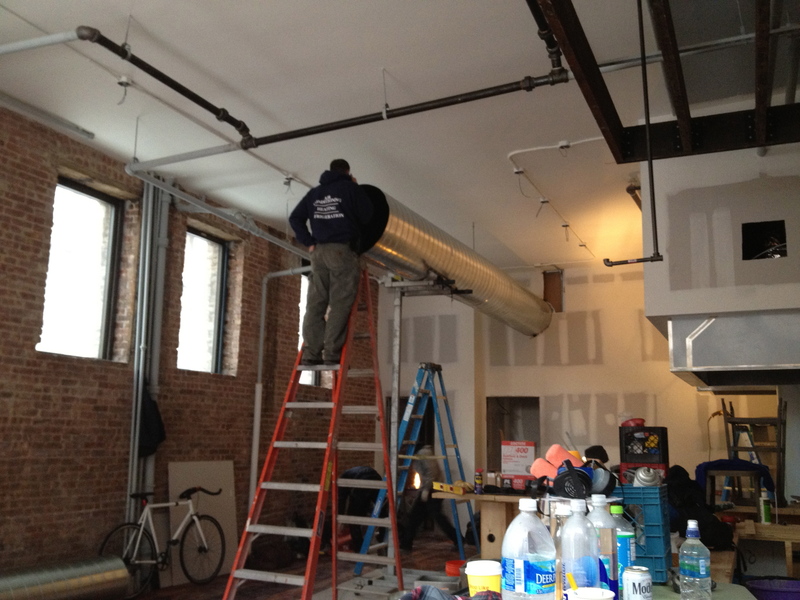 Here, our air conditioning duct is going in. The kitchen equipment wasn't going to be ready (which also posed some unique challenges for the holiday), but the Ansul system was. We thought some lights would be nice. 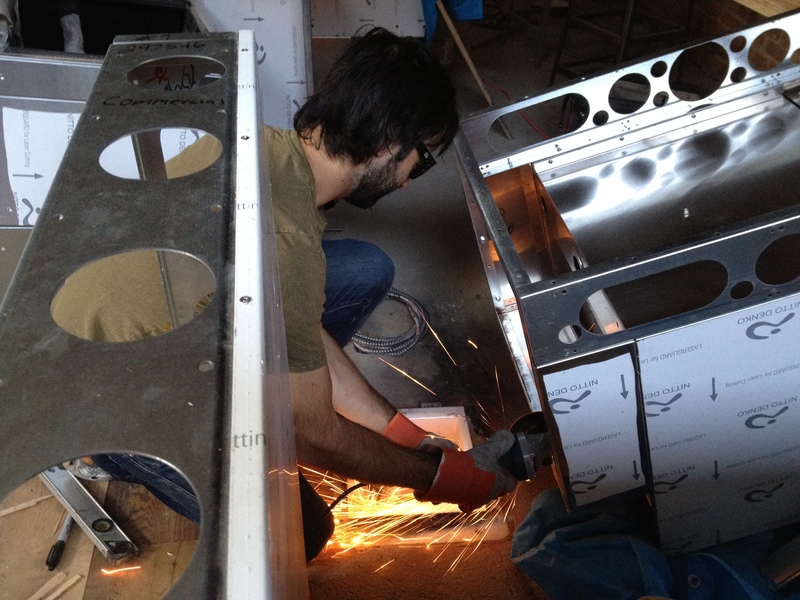 We're making many of the fixtures ourselves. 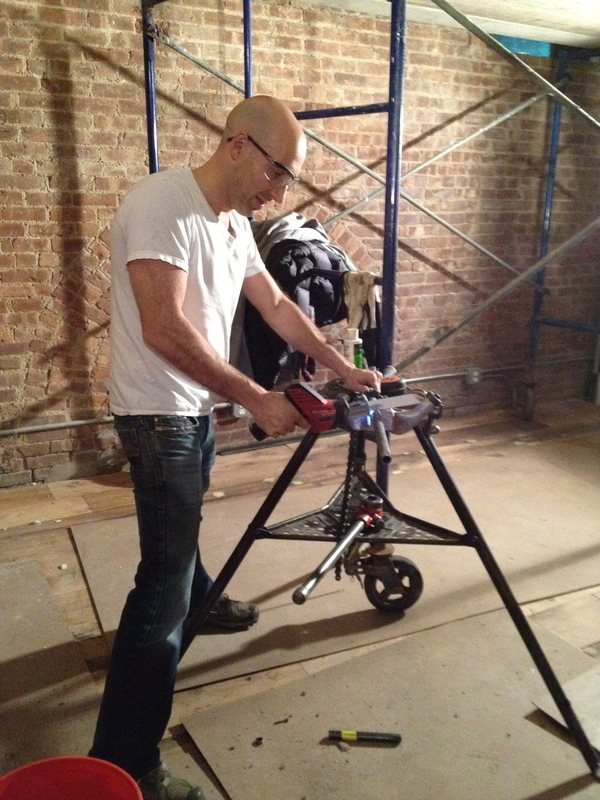 Here, Noah is cutting some pipe. The light fixture making has been a family affair. 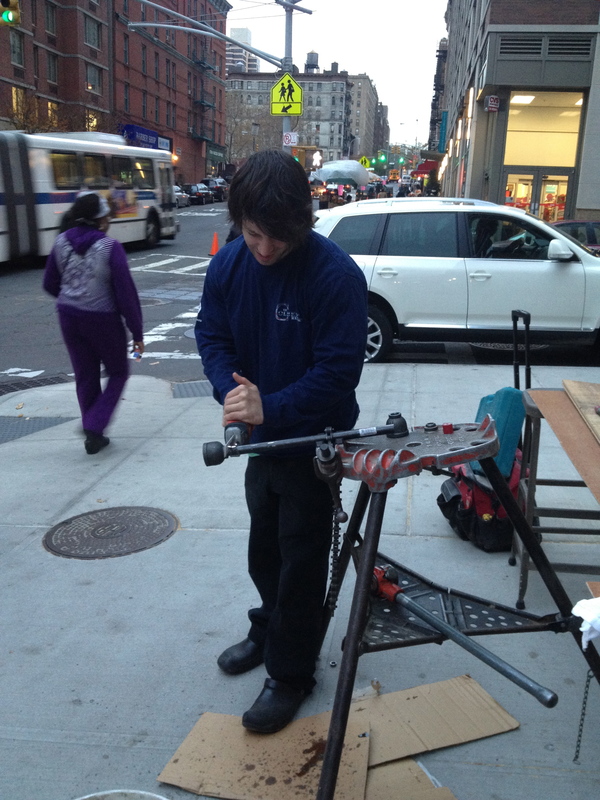 Here's Corey, cutting more pipe while meeting the neighbors. 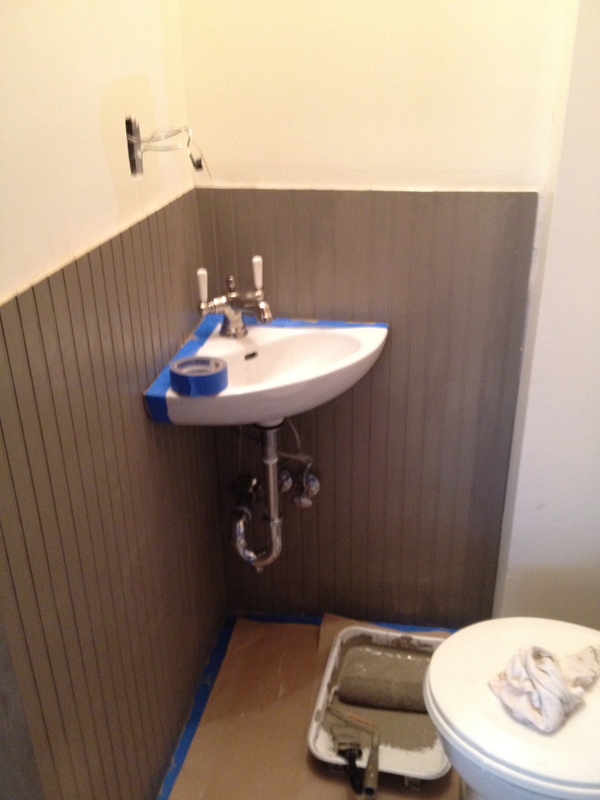 We also managed to finish one bathroom in time. Here's the happy group at the end of the night. Some folks had already left. At one point, we numbered over 30. 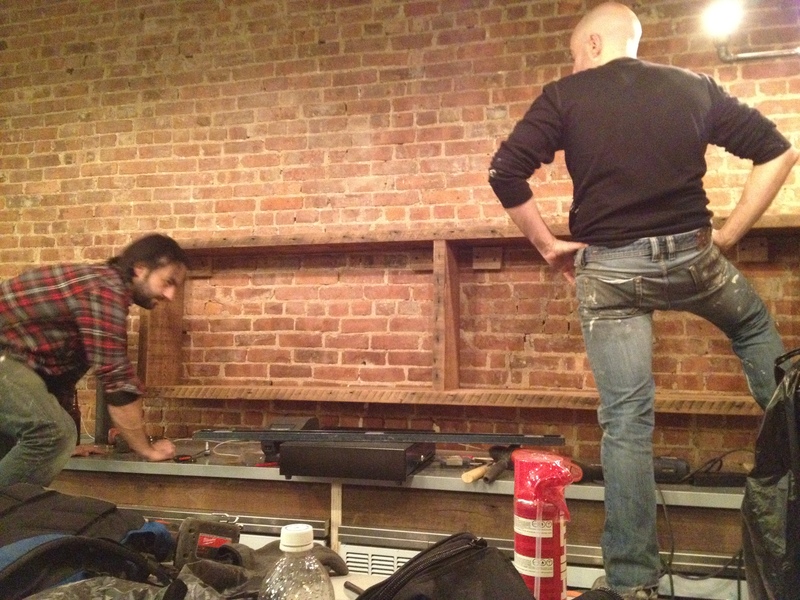 This week we installed the bar framing. This piece needed a little trim to fit properly around the floor drain. Even with just the framing for the two bars, it's starting to feel like a real place. 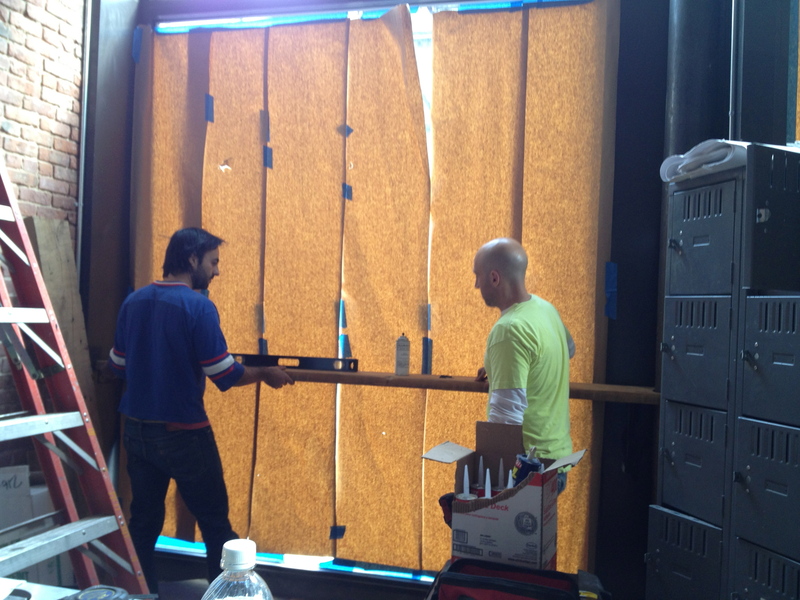 Sizing the drink rail for one of the front windows. It will be a great people watching spot. Sheet rocking began in the basement on Saturday. We had to wait until we had run the phone, security camera and cat5 cables. We purchased extra wood along with our flooring. 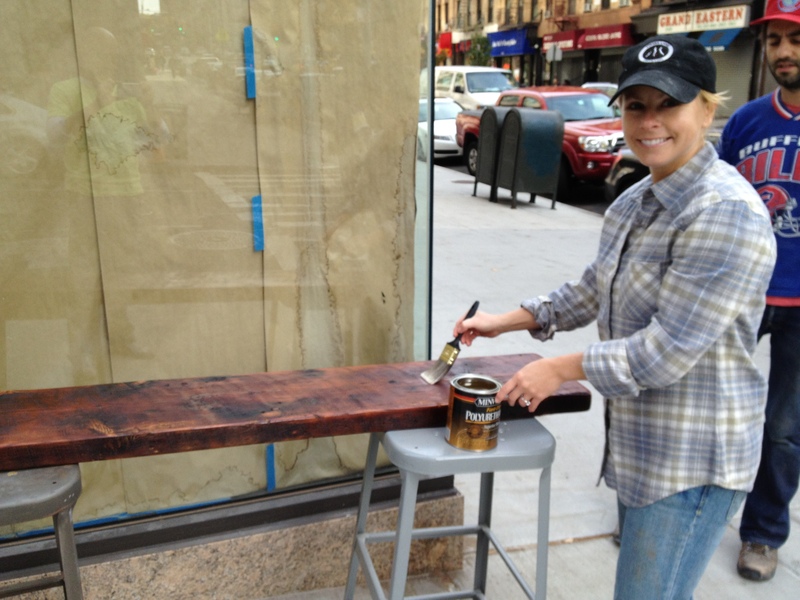 Here, I'm staining what will become a bench. Working on the sidewalk is a good way to meet the neighbors.